In Psycho, Marion Crane (Janet Leigh) is a single woman in love Sam Loomis (John Gavin). He is too poor to marry her, so when Marion has the chance to steal $40000 she takes it. Marion drives all night and day, trying to get to her lover but the weather is bad and she has to stop at a motel for the night. 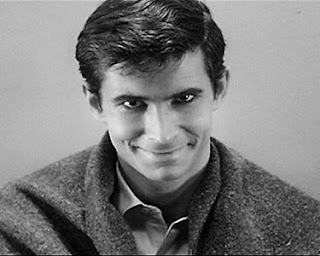 The motel owner is a young man named Norman Bates (Anthony Perkins) who has loud arguments his invalid mother. Marion never sees 'Mother' but while in the shower she is attacked by someone. Marion's sister Lila (Vera Miles) is determined to find her after everyone learns she's taken the money. She heads to Sam's town where she meets him and a PI. The PI becomes suspicious of Norman. A nervous Norman makes some strange comments and the PI sneaks into the Bates house where he has a run in with Mother. Now it's up to Lila and Sam to find out what is going on at the Bates Motel. Back in high school, I had this friend who couldn't take a shower if she was home alone. When she was a kid, she had seen the movie Psycho. The shower scene disturbed her that much. 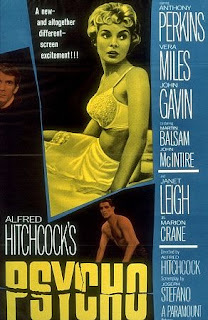 Nowadays with movies like Saw, Psycho seems pretty tame, but when it was released in 1960, it was shocking. It is considered the first slasher film. Hitchcock filmed the movie in black and white even though colour was becoming the standard because it would have been too gory otherwise (according to TCM). There are so many memorable lines in the film, like "A boy's best friend is his mother" and "She wouldn't hurt a fly." I think everyone is familiar with the 'shreech, shreech, shreech' music in the shower. I was surprised at how attractive Norman is when we first see him. He's clean cut, young and smiles a lot. Slowly he becomes creepier. By the end, he's super-creepy. So, what about Mother? If you haven't seen the movie, I won't spoil the fun! Psycho is tame compared to today's movies, but it's still full of suspense. I think it's a great example of how well a movie can work without all of the gore. You have to wonder how many times people have done that shreech sound along with the stabbing motion, even people who have not seen the movie. Hitchcock tapped into something very primal there. Hi Chris, to celebrate your freedom from stolen feeds, I've tagged you for an award over at my blog here. Amazing how Hitchcock could trigger panic with simple props such as a shower curtain. If he were alive today, I wonder whether he'd be caught up in special effects or would still keep it simple -- and scary. It is pretty incredible how Hitchcock managed to make his movies so suspenseful without being gory like today's movies. This movie definitely creeped me out, and stepping inside a shower does occasionally weird me out a little. I was surprised by how attractive Norman is at first, too. I hadn't seen the film before last Sunday, but personally I thought it was still pretty scary. I still get really freaked out whenever I see the mother. Yikes! It's brilliant but not his best film, I love The 39 Steps and North by Northwest. Also, Rope is one of the most suspenseful films ever.